First off, I'm extremely flattered that Sal from Already Pretty has profiled me on her site today. Such a nice surprise. Thanks so much Sal. I wondered why my site views were through the roof. It's especially nice since I was looking at the referrer logs for my Flickr pictures and discovered a Russian discussion board where the participants were saying some uncomplimentary things about my outfits. Not that I really care. I just found it interesting. Today I have no real plans but I went out for breakfast and now I'm getting caught up on The Walking Dead. The show is full of gore and violence yet they seem to have qualms about showing two naked boobies. So messed up. While getting dressed this morning, I had all of this on except the cardigan. I thought to myself "I wish I had a yellow cardigan". Then I remembered, I DO! I found it in a pile of clean clothes in my laundry room, hence its wrinkles. But it's Sunday so no need to be perfect. Wow...it's very wrinkly! Maybe I should have ironed it. I've had these socks for a while and have worn them but I didn't think to build an outfit around them until I saw them on Joni's blog Walking Colors. Fabulous stuff. oooh, I like the cat socks! Hi! I'm here from Already Pretty and I LOVE your style. I just got my first job as a librarian and I must say, I'm quite inspired by your blog to take things up a notch! Two weeks in and already I can tell my co-workers aren't too sure why I dress up so much for work. I think librarians (and bureaucrats) should be fashionable, too. Thanks for your blog! My happy skants! Love those socks and shoes together. That is kind of funny about the Russian discussion board! Part of the internet sensation gig, I suppose. Congrats on the Already Pretty feature - was great to see a whole collection of your outfits, Sal did a totally lovely job. Those socks are so cute! I love my Sock-It-To-Me koi socks. Those Skants are perfect for showing off fancy legwear. Congrats on the Sally feature! Ooh, congrats on the profile! I love those socks - I have them too and have not yet worn them. Glad to hear the profile has increased your blog traffic! Those are awesome socks - loved them on Joni and they are just as fab on you. Also arrived here from Already Pretty and I'm here to stay!! ((waves)) I'm from Already Pretty as well, I'm delighted to have been pointed your way because I love it ALL! 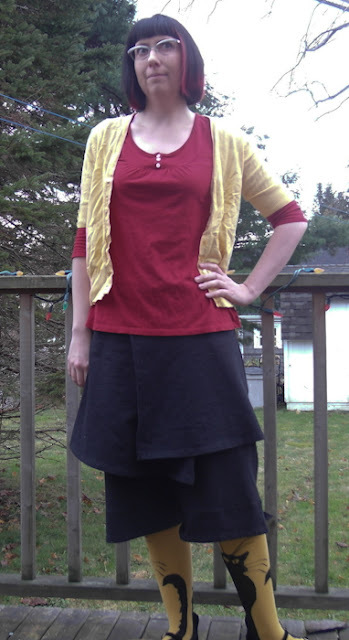 From Already Pretty, too---lately I've been thinking I need to dress more whimsically, and with more color... I am in awe of your style! Flawless! I'm looking forward to tons of inspiration here-yay! Love the socks but adore the attitude even more so :) you and I, we're about the same age, and I love that you're so unapologetic about your outfit choices. You dress for you and that's a rare commodity. Another drifter from Sal's -- and nuts to those Russians. You're fantastic and have my fave ever Fluevogs -- purple Pilgrim Truths. Hooray! Your style is gorgeous! I found you via Sal and bookmarked your blog right away. You have an amazing eye for combining pieces and colors. And all those Fluevogs! Wow! What a treat to find you! Great style! And that means some people will love or loathe it, but at least there's something to talk about. I love the fact that Sal mentioned you and the fact that you absolutely look like you enjoy dressing up. Keep it up!